Imabari has led the towel industry for 120 years as the mecca of towel production. The area has established its position as a representative of Japanese quality with its “safe, secure, and high quality” products. The towels’ softness and good water absorbency have especially gained popularity in exhibits abroad,and its name is recognized around the world. Imabari, Ehime is a mecca of towels that has continued production for over 120 years. There are almost 200 factories that twist yarn, dye yarn, fabricate towels, etc. at this great production site. In addition, the area next to the Seto Inland Sea is rich in nature, and recently is well known as the town where the Shimanami Kaido bridges cross the strait. Increasing numbers of people are enjoying cycling here. The climate here is warm with abundant water. Imabari’s great environment has helped to nurture one of Japan’s best towel production areas. Moreover, the underground water of Sojagawa River is soft water with very few impurities. This water is gentle to the yarn and material of the towel and allows delicate and bright colors while bringing out the natural softness of the cotton used. The “Towel Sommelier” system teaches the world about towel quality. imabari towel introduced a certification system for communicating the quality of a towel to a wider audience. Please see here for taking the sommelier exam. the color of energy, passion, progressiveness, liveliness, movement, and impact. imabari towel is positioned as a product that is recognized in society and represents Japan. the color with a positive image of assured quality, trust, history, tradition, and calmness. This symbolizes imabari towel’s high quality based on its history and tradition. the color of purity with an image of kindness, cleanliness, innocence, healing, and gentle and caring love. This signifies the infinite possibilities of imabari towel. In 2006, Kashiwa Sato used an imabari towel for the first time and was struck by its high quality. At the time, imabari towel was in a dire position due to cheap foreign products. However, Sato was confident.Nowadays, people are more interested in Japanese products due to being cautious about “food safety.” This towel definitely has the quality to be appreciated globally.This was the moment that Sato decided to become the branding producer. Sato then started the imabari towel Recovery Project. These were all strategies to protect imabari towel’s true value, “safe, secure, and high quality,” and also spread the word. Tasks that Sato gave sometimes puzzled the members of the Imabari Towel Industrial Association, but eventually brought everyone’s minds together, and created a firm brand. Later, the strategies based on a firm concept bore fruit, and imabari towel’s brand awareness and sales rose greatly. It truly became a production-region brand that represents Japan. In 2014, when imabari towel had a booth at the “100% Design” event in London, they used a Japanese ladle to pore water on the hands of visitors. People came, and were naturally smiling when using the comfortable towels at the booth where beautiful white towels were aligned. Now, imabari towel is synonymous with area rebirth. He is our creative director and is participating in the branding branch of the imabari towel Project. He also designed the trademark and logo , as well as some original towel products. 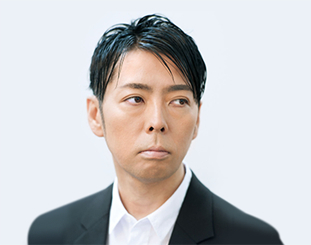 Founded “Creative Studio SAMURAI” after working for Hakuhodo Inc. His list of achievements and his unique creativity are highly regarded: He has done artwork for SMAP, KIRIN GOKU-NAMA, Tokyo Roppongi TSUTAYA, FIRST RETAILING, RAKUTEN group, Meiji-Gakuin University, USSAGE, NHK-Kyoiku “Eigo de Asobo,” NTT DoCoMo “FOMA N702iD / N703iD” and “Kid’s keitai,” UNIQLO NY Global Flagship Store, and the Kunitachi-Shin-Museum. A book, Sato Kashiwa no Cho-Seiri-Jutsu, published by Nihon-Keizai-Shinbun, was a bestseller in 2007.